Chinmayi S K presented the methodology for the Safe Goa project at the 5th International Conference on Technologies for Development (Tech4Dev 2018) held in Laussane, Switzerland from 27 to 29 June 2018. 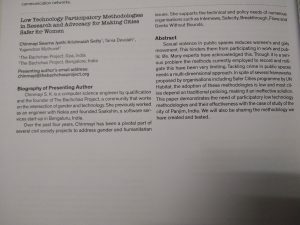 A working paper titled “Low Technology Participatory Methodologies in Research and Advocacy for Making Cities Safer for Women” authored by Chinmayi S K, Yugendran Muthuvel and Tania Devaiah was submitted for the conference. 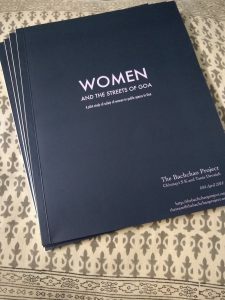 The final paper is scheduled for release in September 2018. 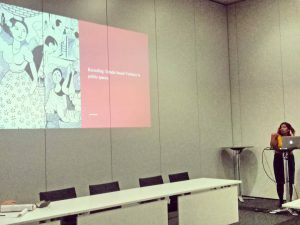 The conference was organised by the UNESCO Chair in Technologies for Development at the Cooperation & Development Center (CODEV), École Polytechnique Fédérale de Lausanne (EPFL) in Switzerland.